The Solar Spectrum Reflectometer, Model SSR-ER version 6 features a selectable solar measurement spectrum matched to a variety of standard global and beam normal solar irradiance models. The SSR provides accurate measurements on both diffuse and specular materials, even second surface reflectors up to 0.25 inches (6.4 mm) thick. Solar reflectance or absorptance is displayed to 0.001 units, with a repeatability of 0.003 units. For detailed information on the technical aspects of the instrument, refer to Tech Notes 79-16, 83-1, 86-1, and 09-1. To match various solar irradiance reflectance values, two “virtual” detectors are added to the four actual detectors. The four actual detectors cover broad wavelength bands roughly centered on the UV, Blue, Red and IR. The two virtual detectors are added by resampling the Red and IR detectors at a lower lamp color temperature. With effectively six detectors it is possible to generate a good match to a variety of solar irradiances. 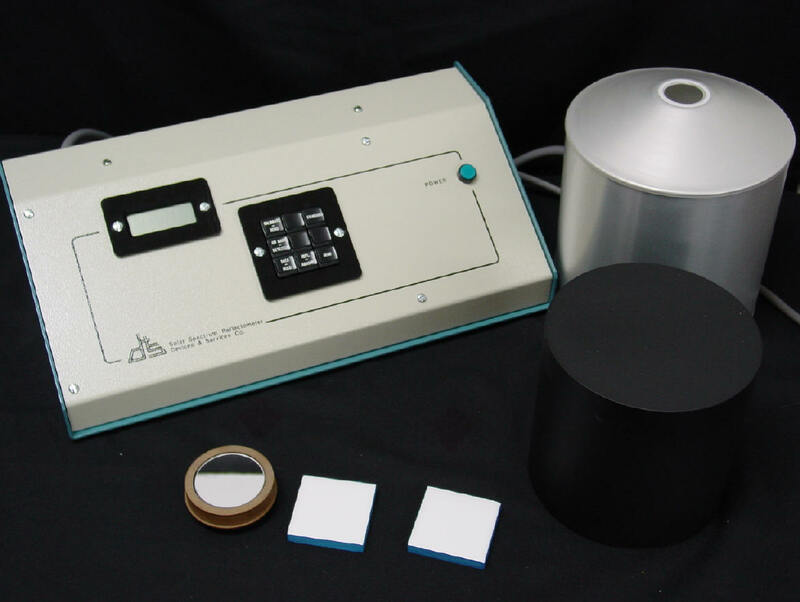 For typical global and direct irradiances, the SSR reflectance readings match calculated reflectance based on spectrophotometer readings with a bias of less than 0.002 and a standard deviation of about 0.005. Calibration and adjustment of the measurement spectrum against one of the supplied standards is accomplished with a single key stroke. Calibration data for up to five additional standards can be saved in memory, permitting the use of working standards other than those supplied. A 'hold' function that freezes the current reading can be initiated from the keypad. This is useful for applications that require the measurement head to be handheld. It also allows reflectance or absorptance for different solar irradiance matches to be displayed for a single measurement. Firmware supports a number of operating modes including sample and hold versus continuous sampling, auto or manual send of reflectance data to the serial port and emulation of version 5 reflectance readings. Along with the three calibration standards supplied with the instrument, four additional color tile standards are supplied to track the color temperature calibration of the instrument. These tiles are selected to have monotonically increasing or decreasing reflectance over the wavelength range of one or more of the detectors. Send mail to webmaster@devicesandservices.com with questions or comments about this web site.